The 2014 Kawasaki Z1000SX is a clever, considered and very worthwhile update of an already excellent machine. The Z1000SX was already something of a connossieurs’ choice: fast, effective, decently equipped, involving, good value and yet understated and unshowy too. Kawasaki hasn’t lost any of that. It hasn’t thrown the baby out with the bath water. Instead it has corrected or improved what it genuinely needed based on feedback of the old model, enhanced what it didn’t and then added a bang up to date technical cherry. Simply put, Kawasaki has made an already great bike even classier. Conceived to fit between the naked Z1000 and the track-focused ZX-10R, the Z1000SX is an almost perfect mongrel – delivering much of the excitement and character of the Z1000, performance of the ZX-10R yet all in a more comfortable, upright and practical package. The new Tokico brakes have more bite while the suspension’s revised damping rates and the shock’s heavier spring improve the ride quality. The revisions to the mirrors, seat, panniers and even induction noise all mount up to make this a vastly improved machine. There was nothing much wrong with the old model’s engine – it was already reckoned to be one of the best around thanks to its combination of excellent fuelling, massive range of useable grunt and true top-end zest – but here Kawasaki has aimed to improve it by delivering even sharper throttle response without affecting peak performance. They have accomplished their goal. The motor feels fresher and the addition of traction control and power modes brings a missing level of sophistication to an already excellent experience as well as peace of mind in the wet. The SX has a high level of finish and the engine is as solid as they come. ABS costs a £400 premium while a ‘Touring’ version comes with panniers for £500 extra. The SX comes with three-way traction control, two power modes, optional ABS for £400 extra and panniers for £800. 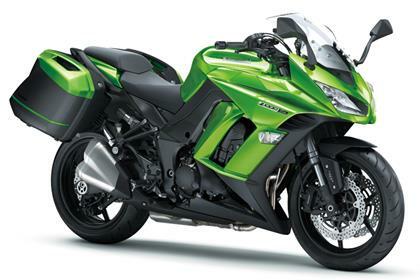 2011 Z1000SX launched, updated in 2014. 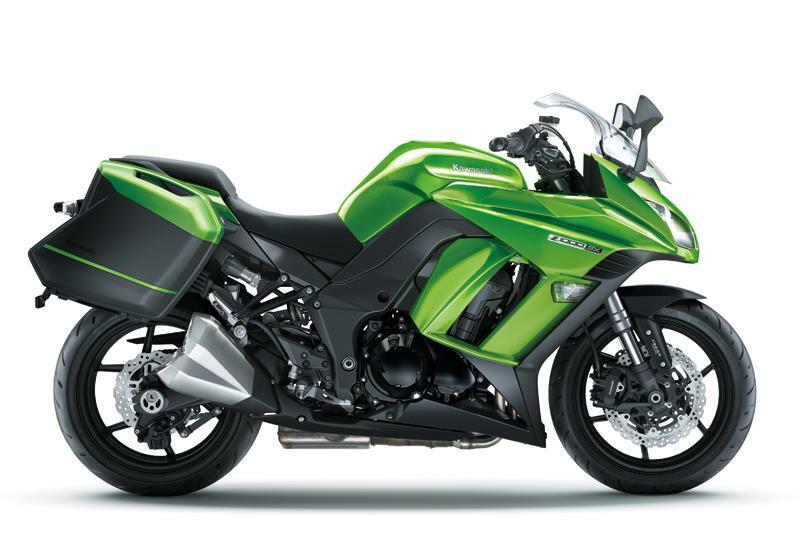 19 owners have reviewed their KAWASAKI Z1000SX (2014-on) and rated it in a number of areas. Read what they have to say and what they like and dislike about the bike below. This really is a very good, stable, very fast accelerating bike. Not the fastest at the top end but absolutely fine in the real world. Love the look of it too. What's not to love. Superb. Fun and practical. Great sound too. Hooligan if you want it to be. Sounds like I imagine an aircraft carrier would out of water. After doing 4k it's been blemish free. Cannot be faulted. Rock solid. Love the sound on the standard 4 pipes. First rate. Excellent. Lloyd Cooper in Watford were top boys. I wanted a more all-round bike that could tour and be sporty when required. The Z1000SX does all of this with ease. There's a great riding position, but for me the seat is still slightly uncomfortable after about 100 miles on the road. The ride is quite nice and the suspension adjustable, although I have not fiddled with it yet. Brakes are very good. Initial bite is good and will stop you in most situations. Grab a bit more and you’ll stop on a sixpence. I was surprised how much grunt the engine had for a 4 cylinder. You can ride around all day never going above 6000 rpm and never be overtaken. It's nice smooth power with great fuelling. My only criticism is that the engine is more buzzy than I thought it would be - especially above 6,000 rpm. You do get used to it though. The exhaust note is lovely for a standard set-up, albeit a little quiet. It is built pretty well compared to the Triumph I traded in - although there is a fair bit of plastic. I did have an issue with the rear wheel bearing on the first service - this turned out to be a rear spindle drilled of centre. I’m guessing this is pretty rare and I was just unlucky? The bike has stupid service intervals. My Triumph services came at every 10,000 miles, so why do Kawasaki have them every 4000? There is good levels of equipment and more than I have had on any other bike I’ve owned. To make it a better tourer, it would need a centre stand as a minimum. Heated grips and cruise control would be nice, too. I bought from a dealer (Wheels of Peterborough). They have excellent staff and service. This has the looks, comfort, power, reliability, what else do you want? Only my third bike in 2 years of full licence. Started with a GSR600, then a CBR600F ABS, now onto the Z1000SX. Wanted one from start, but was too costly on insurance for a “novice “ rider. Plenty of power, easy to ride, seat a little on high side (in 5/10 13 stone) for me, can feel a little heavy in the twisty bits when pressing on, amazing power delivery and a very flexible ending at that too. Bike makes you feel comfortable relaxed and quietly confident. Would have preferred ABS, and a more comfortable seat, it’s very hard! Would recommend without hesitation. Non ABS on mine. They stop very well, but sometimes feel they're going to lock a little too easy. Super smooth, induction noise is highly addictive even on standard exhausts, very flexible pulls comfortably from 23mph in sixth gear without a fuss. It's very quick if you want it to be, but need to change up very quickly. 18k and like new all over. Servicing reasonable, insurance cheap for what it is, tax £88 year, I get mid 40’s mpg mixed cruising, motorway, A roads, B roads and a good thrash in between. Personally I think it should have ABS as standard even on the pre-2016 models. Adjustable screen is a god send, really does work very well. Main dealer M and P’s Swansea, Josh – Can’t fault him or the service. Cheers guys! Available in any colour, as long as it's green. I've been a sports bike rider for 27 years, every bike I ever owned was arse up, head down and balls out. Came from an '04 ZX-10R to the Z1000SX so you'd think I'd say the Z1000 feels heavy, under powered and cumbersome by comparison.....but I wouldn't. She's not a lightweight bike but once rolling it all feels very flickable and that superb motor provides a surge of smooth power wherever you are in the rev range. Ditch the OEM tyres though, they're shocking in the wet and most dealers will replace on request. 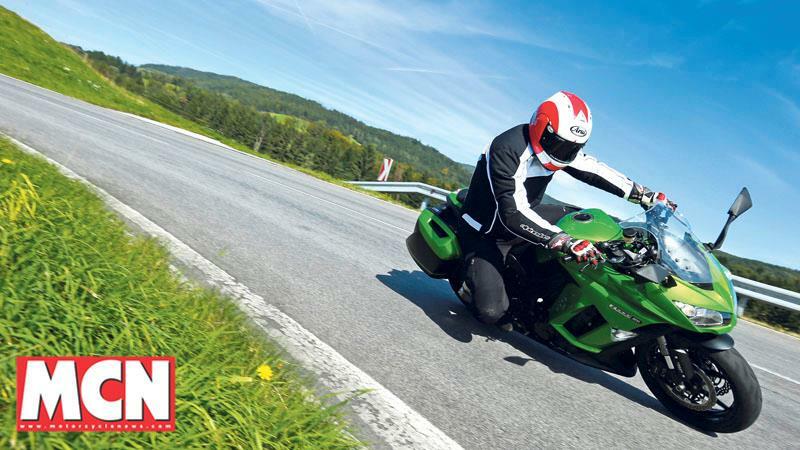 Kawasaki front ends have always felt laser guided and this one is no exception. Part of the reason is the corner angle measuring ABS fitted as standard, decades of engineering experience building superb brakes and wavey discs that aren't just for show make up the rest. Riding position is relaxed and smooth and if you're a taller rider I can highly recommend the factory fitted frame sliders which are the perfect height for putting your feet up to stretch legs out on long rides. I swear the mid range response is better than a ZX-10R. It'll only be right at the top end of a screaming engine that you'll notice a lack of puff in comparison. Kawasaki lumps are bulletproof, always have been. They're not named 'Kawasaki Heavy Industries' for nothing. The only reason she doesn't score a 5 is because the mid range grunt of that lovely motor encourages the rider to give it a lot of right hand whenever the opportunity presents itself....and the fuel economy when the taps are open isn't wonderful. Daily riding around town gives me around 43mpg as long as no AC/DC comes up in the playlist, motorway cruising gives closer to 50. Coming from a bike that had a rev counter, speedo and idiot lights......I've now got a full Ford Mondeo dashboard. MPG, average MPG, air temp, tank range, 2 trip counters, fuel gauge, heated grips as a factory option, ABS, 3-stage traction control with 6 point angle measurement and a 12v power port with a USB adapter, the only thing missing is cruise control. The really weird thing about this bike is if you're in 4th gear or higher there'll be enough power on a closed throttle to do 17mph. 27 litre panniers come with the touring pack option, internal bags and a very clever quick release system make them a no brainer as an option and a full face lid will happily fit inside without a fuss. The design also ensures the panniers reach no wider than the mirrors so you stand very little chance of a nasty shock from the rear end while filtering because you forgot they were on. Smooth power, well mannered bike. Superb handling and that engine tone. Travelled to Limousin, France without issue. Bought a sheepskin seat cover in preparation but didn't use it. Well balanced with asscertive braking. Owned for 10 months from new. No issues whatsoever...just turned 6K miles. Bright, clear headlights. Panniers attach without the need of a rack which retains the bike's beauty when removed. Normally run Road Pilot tyres but quite happy with the OEM Bridgestone SP2 tyres. It is a great bike to ride, but I found the seat uncomfortable after a couple of hours. Have invested in the gel seat which was another £300. Also there are some vibrations through the foot pegs at motorway speeds, but not too distracting. The engine is fabulous and wonderfully flexible. You can potter along at 30 mph in sixth gear, but as soon as you open the throttle it takes off. Only bought the bike in March 17, but so far it has been flawless. As with all Kawasaki bikes, service intervals are every 3750 miles, which is not ideal. This bike has all the electronic gizmos you need for fast and safe riding. However, I am surprised it does not come with either heated grips. More surprisingly, it does not have cruise control, and it is not an optional extra, which is a major oversight for a tourer. Fixed at last ! ! Version : Tourer but with Givi 3-part luggage. Lights very poor for night riding. Seat damned uncomfortable. Now fixed, it is how all my past Kwakas have been, fab. Shame I had to suffer such a dangerous situation. ABS late in coming on but works well when it does. Feel very good on front, rear requires good push but work well. Sweet and pulls strongly from 1,200 in 6th. Bike kept cutting out and I fell off twice. Kawasaki came to rescue and the bike is now brilliant. It appears it was the dealer who was to blame. Had the bike for 3 weeks, said fixed, engine cut out 800 yards down the road. They had not set idle properly. Contacted Kawasaki again who, this time, were tremendous. Even fixed the fairing that was damaged on one of my 2 falls when engine cut out. Do 4-5k a year touring, service costs with intermediate oil/filter around £300. Disappointed with 2nd-hand value, not held up as much as I expected for the best sports tourer around (my opinion) with bullet engine. Fitted a gel saddle as a matter of urgency plus a pair of spots. That done, what the bike has, for the price, is great value. Should allow a top box with the standard panniers though for a proper tourer. Had to fit Givi to tour successfully. Bought new, dealer went bust, substitute dealer could not be bothered.  Just left deposit on a 5-month old 17 plate private seller SX Tourer. Would love the H2SX but just could not afford. This is my 2nd SX and am very happy to be buying the 2017 upgrade model. The bike has become a death trap and no-one is interested. On changing gear which takes what, 1/2 second, after 9 months from new, noticed an occasional engine cut out as changing gear using clutch. Has progressively got worse. Clutch in, blip throttle when changing down, clutch out and, as you do, engine stops. Does same going up but no throttle blip. Thrown me off twice at slow speeds. As you go to accelerate out of the roundabout with your feet just put on pegs, you let out clutch and open throttle to move off, engine stops and you drop bike. Been to dealers 4 times. Contacted Kawasaki twice and now, £11,000's worth of bike and I just dare not ride. Problem is happening several times every hundred miles whereas originally, it was a couple of times a thousand. I just do not know what to do. Think it is going to be a solicitor and court case. When bike was working, it was fab. Now, to have the engine stop at 120mph as you change from 5th to 6th certainly cures you constipation. I am joking but it is a bloody serious matter to which Kawasaki just cannot be bothered. Back to BMW but how can I sell this to another motorcyclist? I would never forgive myself if anything happened. Poorly designed for a tourer and lights very poor. Dissatisfied with dealer who has gone bust. Not surprising. kawasaki got it right with this ..
rather high revvy engine but super smooth and plenty poke in all rev ranges , this bike does exactly what youde expect from a kawasaki . comfy too , great on fuel and all round a great bike . the suspention 2 up is the only thing ive a gripe with , but since i dont ride too much 2 up ile leave it alone ..
Fast fun and able to tour. Once the suspension was set up £38 it rides like a dream. Did a Euro trip of 1908 miles in July this year never missed a beat. Bike cost me £9200 with boxes and inner cases bargain. If this bike had a 12volt socket and a gear indicator it would get the full 5 out of 5. Got my Bike from Bournemouth Kawasaki one of the best dealers I have purchased a bike from. Got a little fed up with my MV Agusta F3 800 and opted after some research to go for the Z1000SX. I have owned a number of bikes in the past but never a Kawasaki. So far I am very happy with my choice. Comfortable riding position, very light clutch and a slick gearbox. I think its a great looking machine. Its not faultless, like others have said, it really should have a gear indicator built into the display, rather than an optional extra stick on box and maybe a quickshift would be good. Cant comment to much more as only owned it for a week. I really approve of the riding position and suspension, no issues there. I do carry a pillion at times and she says that by the hour mark the bum is numb and needs a break. I use the bike for work into London on dry days and for a litre bike i am very impressed with its manoeuvrability, as I split lanes and fight to get over the Dartford River Crossing/M25 its very light and easy to weave, then once your out the traffic, open her up and away you go. Engine has a good solid feel and good history so feel confident that it will have longevity. Good even power delivery up through the range but without the gear indicator kept looking for another gear at the top, maybe Kawasaki need to look at this. Its fine but just feels like its revving to high for 6th. This will be my dry weather bike so will probably be fine, however only time will tell. Appears to be well built and obviously the engine is tried and tested. Cant give an accurate answer yet as still making my way to the first 600 mile service so guess the running costs will be similar to my other bikes. I like the aggressive styling of the bike and a number of work colleagues have commented on how they like the look of this bike over my F3 800 which has surprised me! I opted for the gear indicator and top box. I did want the tail tidy but you cant have that with the top box fitting. Tyres seem fine but again only done 400 miles at time of writing. The dealer I used which most helpful and wouldnt hesiate to use again. They did me a deal on the bike with some of the extras I wanted included in the original asking price. Couldn't be happier, I replaced my Concours 1000 (Gtr1000) to you Eurpoean folks as I am in the states. Love the weight reduction, performance and handling. Plenty of torque but screams for an overdrive gear or taller gearing. gas mileage baffles me when my old Concours without fuel injection and 200lbs more weight could get 55mpg cruising at 75mph and this bike struggles to get 40. Quality throughout, no cheap shortcuts. I live in the rain here in Florida and between that and the salt air seeing no corrosion on anything is a good feeling. Lack of ability to mount both the hard top case and saddle bags makes me wonder what the marketing folks at Kawasaki were smoking? Stupid! Paid exactly what was on the sticker US $12,199 with the bags from a dealer. Needs taller 6th gear for touring, after all, it is a sports/tourer not just sports!! Overall the bike I first thought was incredible, did everything I expected it to do and more, comfort, performance and the Mrs was happy and comfortable on the back. And then the roads were salted and the build quality and parts quality shown their true colours. I do not do many miles in winter in fact I hate it, it's too cold but I took it for its service just as the cold weather hit ready to tuck it up for winter, got it home and cleaned as I did to all of my previous bikes. Looked at the bike while in the garage and spotted that pretty much every part that could possibly corrode had corrosion, the chain was just brown with rust (yep just been serviced before being put away) It's now 6 months old and 800 miles and looks 10 years old plus. Kawasaki uk don't want to know. I would advise if you are looking to even push the bike out of the garage during winter time to seriously consider something with a little better build and parts quality. I have only ever owned kawasakis and none of my previous some being 10 years old looked this bad close up! My dad rides all year round and hardly ever washes his 04 plate BMW which looks absolutely mint compared to my nail of a bike. Lovely comfortable bike to ride, brakes are sharp and work perfectly. Power there on request cannot fault this bike at all for power delivery. Severe corrosion to all metal parts: Rusted chain Rusted and corroded brake discs Mechanically the bike runs perfect and I have had no problems in that respect. It is only 6 months old though! Servicing is 200 a year as on service plan. Looks as though it needs a fair few hundred more replacing corroded and rusted parts. Although I had to have a gel insert fitted as my bum starts to groan after an hour or so. Now 2 hours!! Feel the lights could be better. LED's at the back but plain old bulbs at the front and, for the speed I, and probably most of us, ride at night, I would expect something with more penetration. Have had to fit a couple of long-range Denali's. Standard screen is crap, throws wind right on the gap at the top of my jacket zip. Put a Givi tourer on. Also put on a 3-tooth smaller rear sprocket. Was just too fussy at 70-80. Now 4-4,500 revs and so much more relaxing. Topped 160 with a few hundred revs. left so has improved top speed but there is a trade off with acceleration. Not much but noticeable. Despite some of the adverse comments, I am extremely happy with the bike, would readily purchase another and recommend to anyone who wants the joy of a decent sport and tourer in one. Suspension has been difficult to set up and it is very noticeable if you don't adjust tyre pressure to within a gnat's knacker either side. Hero peg goes down without too much complaint. Quite hard though, for a tourer. Bought middle of April, 6k by October (now greased an in garage, use the KTM in winter) and has been a dream. Above is the cost of the 2 services so far, 600 and 4k, competitively priced. Many may not agree with me but, to supply a bike classed, and built, as a tourer, to not be able to affix a top box is ridiculous. Also, the 25 litre panniers are a little on the small side for serious tours. Took mine off and put on Givi 35lts with 55ltr box. Along with tank bag I am happy to tour for indefinite periods with no real loss in width or looks (I had the panniers/box part sprayed in candy red to match). Had to then fix some rear/brake lights to the number plate as, with the box, you can hardly see the standard rear lights,they are so far underneath. Would have been so much easier for Kwaka to design this necessary addition and offer as an option. Mirrors show an awful lot of my shoulders ! ! Bought from dealer. Will not divulge name but, as a main dealer, was not at all happy with advice or service and will not use again. Fantastic engine, handling not the best as standard, after adjusting suspension and changing to Pirelli angel gt Tyre's its now spot on.fairing does a decent job in the wet, engine noise increases when screen in top position. I bought the grey one, colours are safe but not enough to put me off. Buy one you wont regret it unless you can afford more than one bike for example a BMW tourer and a ducati monster. Good at most things, you can cruise all day, thrash it and it does a good impression of a sport bike. Brakes are good and if feels stable when baking hard now fitted with angel gt tyres. Has as decent amount of power everywhere, lovely top end rush, std pipes make a cool rasp. Only one problem so far, a stripped caliper bolt and threads on front left leg. Happened when at kawasaki dealer changing front tyre, repaired under warranty. Not much different from any other inline 4 for costs, like my dealer you can watch through a window while they work on your bike. also free coffee and biscuits. I love the whole package it does a great job of making me smile. Tyres as above angel gt, great so far. Kawasaki 4yr warranty, like this for peace of mind. Brakes are tremendously powerful with brilliant feel. White lines early on in tyre wear when still 40% tread left. Have ridden Triumphs for nearly 40 years, my last 3 being Rocket Roadsters and they could learn a lot from the quality and finish of the Kwaka. Particular the gearbox which is so sweet. Lack of top box and pannier capacity seriously dents its long-rang touring ability and no heated grips is a real downer on a touring (albeit sports orientated) bike. It is still a tourer and grips should be standard as, really, should a gear indicator and touring screen. I have added all these with USB car accessory plugs. And a better distance saddle would not go amiss!! Reasonable deal but the dealer's knowledge of accessories and some of the service work was both abysmal and dangerous. And what an upgrade it has been... I had the ER for 2 years after a 23 year break from biking, but 2 years on and 14K miles I was ready for an...upgrade. I passed the IAM test and have been on and continue to book track days to help curb my boy racer/speed demons, as well as improve my riding overall! I still wanted the upright riding position. I can only ride SS machines for 20-30 mins before I get wrist/hip/back and neck ache/s (Ol' man now at 43! lol) I bought the 2014 ABS Tourer; it's the perfect move forward in the absence of a Z800SX for the ER. Its practically twice the price, twice the power, twice the quality - it feels like TWICE the bike. It's an ER on steroids, but with class and refinement that you wouldn't necessarily expect. It's very easy to ride. Comfortable, smooth gearbox, beautiful (licence losing) power delivery, as well as capable cruising ability returning low 50mpgs, if you stick to road legal speed limits. The 2014 updates for power modes/traction control, tool free rear suspension pre-load and a roll bar fee (SOoo tidy) pannier system you can take on & off the bike in under 30secs make an already good bike GREAT (IMO) If you want something sensible, yet AMAZING fun, great looking and sounding; this could be the bike for you!